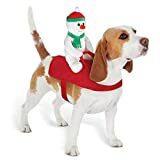 This holiday season or even on Halloween, dress up your furry best friend with this cool new Snowman Dog Rider Costume. This whimsical harness makes your dog appear to be giving a little smiling snowman a ride on its back. 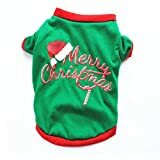 As adorable as this is, don't even think of trying to get it to fit on your evil cat if you value your life. Harness fits chest: 20"-28.5", back 9.5"